The Kegco 4.775 gallon wide moth glass carboy is the perfect fermentation container for 3 gallon batches. This carboy has a wide mouth allowing you to reach inside, making adding and removing ingredients as well as cleaning much easier. Being able to reach your entire arm into the vessel permits you to clean the entire surface area ensuring there is no bacteria build up. 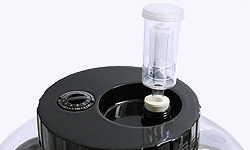 The Kegco carboy comes equipped with a screw top lid that ensures it stays in place throughout the fermentation process without slipping out the way a foam bung might. The lid features a removable cap in a recessed area that can double as an air lock or hold a #3 stopper for your own airlock. The carboy also includes carrying straps that make it easier than ever to transport the carboy, especially when it's full and heavy. 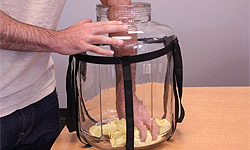 This carboy is constructed of glass that does not hold odors after fermentation and does not easily scratch making them easy to clean and sanitize. The glass vessel is airtight and will not break down over time. If you treat your Kegco 4.755 gallon carboy with care, it can provide decades of great performance. 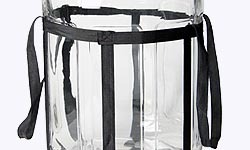 The Kegco carboy is constructed of glass meaning it is less likely to get scratches and scrapes the way a plastic carboy or brewing bucket would. The wide opening at the top of the carboy allows you to reach your entire arm inside ensuring the no bacteria is left behind when being cleaned. Not only does the wide mouth opening make it easy to clean, it allows you to easily add and remove ingredients during the fermentation process. When using this jar as a fermenter, gas will be released from your brew. The removable cap on the lid allows you to install a drilled #3 rubber stopper with your own air lock so the gas can vent without allowing in oxygen. If the vessel were sealed airtight, the added gas could cause the jar to explode if not vented properly, but if there is not a good seal, your brew could be come oxidized. 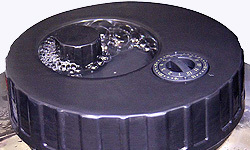 The lid has a recessed area with a removable cap that can be replaced with a breather cap to use as an air lock. The breather cap allows gas to escape from the container during fermentation and having it in a recessed area allows you to fill it with sanitizer so that the released gas can bubble out, but harmful oxygen and impurities cannot get in and contaminate your brew. The lid features an adjustable dial that allows you to set the date that you begin fermentation making keeping track of multiple batches easier than ever! 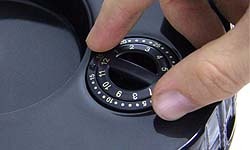 To use this feature, simply turn the inner dial to the month and the outer dial to the day. Say goodbye to the days of sticking a piece of tape on the side with a date on it. If you've ever tried picking up a slippery jar that's filled with a few gallons of liquid, you'll appreciate the convenience and safety of having a strong woven nylon strap to lift and carry the jar from place to place. The straps fit snugly around the jar and criss-cross the bottom to evenly support the weight, but can be quickly slid off the jar for cleaning.